Whew. First I must mention that I made cookies again. Lots and lots of oatmeal cookies. I used the same recipe that I had used in this previous post, but I made the cookies a bit smaller and multiplied the recipe by 1.5. Ended up with about 70 cookies, stuffed about 25 per bag, and sent them on their way to studio. The rest stayed home and were promptly devoured. 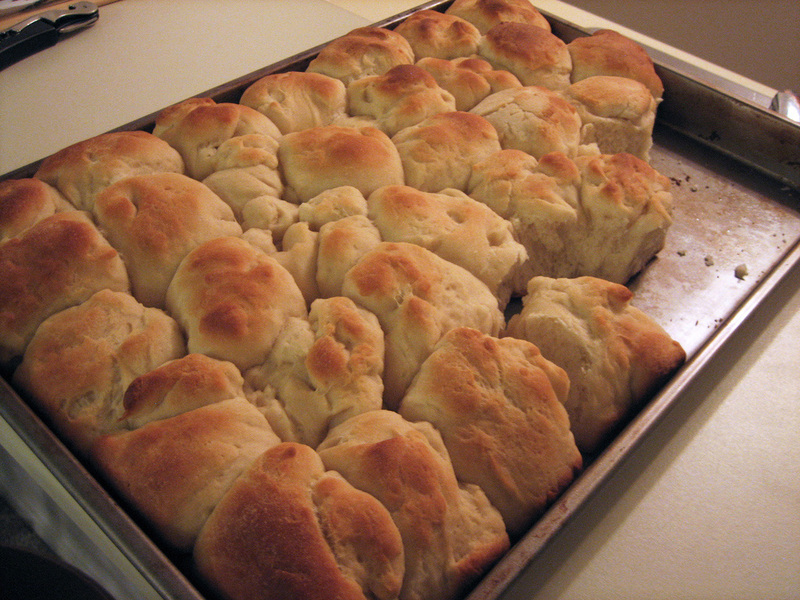 Then I made rolls. Yay! Don’t have a loaf pan here, so I haven’t been able to make bread again, but I do have a baking sheet so I tried out this recipe and I think they turned out rather yummy. Pretty easy to make too. Next time I’ll probably halve the recipe because this made a lot of rolls (not that my roommate minds). I love getting mail! My sister mailed me this cute little spiders thing. It’s currently hanging from a light switch in our hallway. Festive-y, right? A while back I won a giveaway from SimplyNu, and I received this delicious piece of handmade Castile soap in the mail. 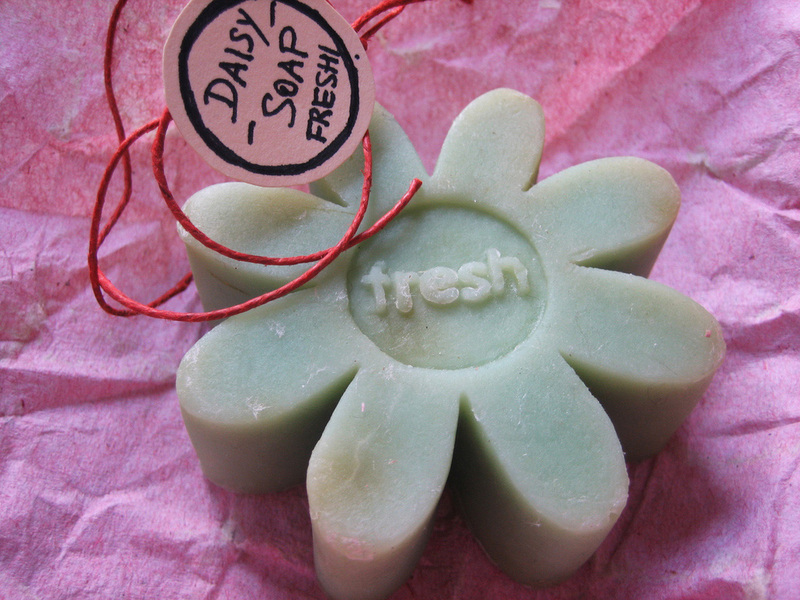 It’s called Daisy Castile and I must say … its scent is heavenly (and the flower shape is too cute). They’re pretty new and their etsy shop has a lovely range of candles, soaps, and stationery. So, a big thanks to SimplyNu! I wish them the best with their store. Last but not least, my current creative space. Lots of black, I know. Halloween is next Saturday, can you guess what I’m up to? There’s black tulle, black elastic, black feathers, and some silver and black jewelry. I rather like my costume idea, but since it has yet to be created, I won’t say much now. 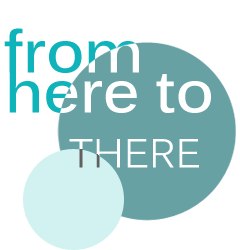 Linking over to kootyoo for a whole bunch of creative spaces. And over to Southern Hospitality for recipes! Goodness gracious, this was a long post! This morning I was lying on my floor (as I am apt to do) and looking up at my ceiling. Then I realized that I am a very weird person. 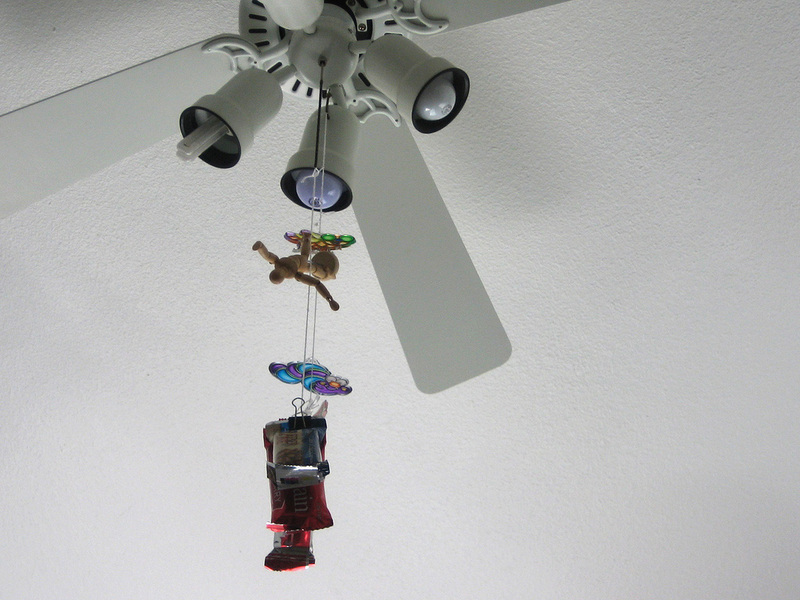 The pulls to my ceiling fan were too short when I moved in, so I attached string for length as a quick fix. Bit by bit I’ve been adding things to them. 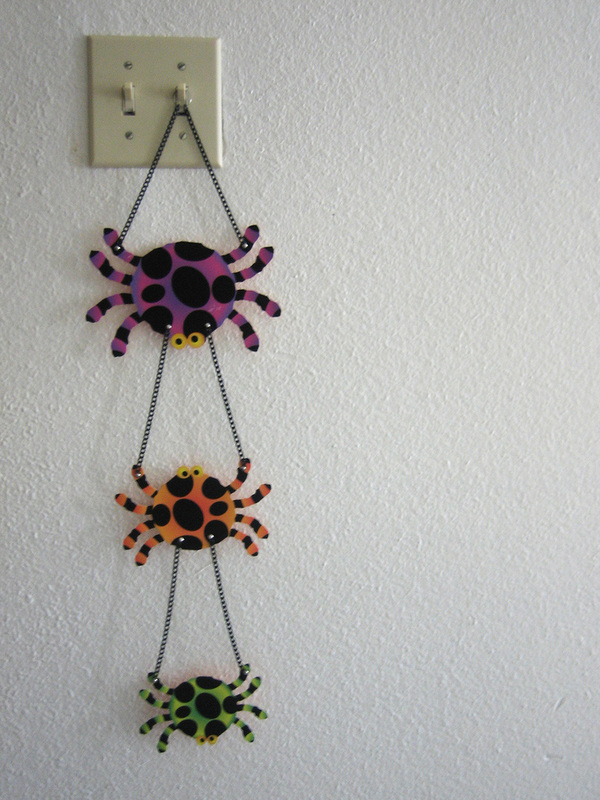 First were three plastic sun-catchers shaped like insects. I had painted them with my friends before going off to college, so I wanted to display them. Okay. Then came Bob, my mini-mannequin. He’s been a fixture in every studio I’ve had, so I put him up there too. The string was too long, which was annoying, but instead of cutting it like a normal person, I let it hang there. Eventually I added a binder clip, which I had just taken it off some papers. I found an uneaten granola bar in my bag one day, so I attached it to that clip. Now I have all of that hanging in the middle of my room. Currently there are three granola bars up there at about eye level, which means that I am bound to walk into them at least once a day. I don’t mind. Weird, right? I LOVE the idea of having food hanging from my ceiling fan. It’s so useful since it saves me those five steps to the kitchen when I want a snack. Yeah, I’m a total weirdo. Who would’ve thought a fan pull would/could evolve into this? My creative space is a mess. My crafting table is generally pretty clear with everything pushed into a corner, but that has been completely empty for a while. Organized chaos is the name of the game for the rest of my room. Everything has its place, but within that place it’s an anything goes kind of system. My embroidery floss is all neatly arranged according to number, with remaining spaces crammed with scraps of ribbon and string, other boxes holding magnets, bottle caps, and buttons. All my fabric lives in a cardboard box … well, except for the fleece, cheap green stuff, and some pink print because not all of it would fit. Aye. 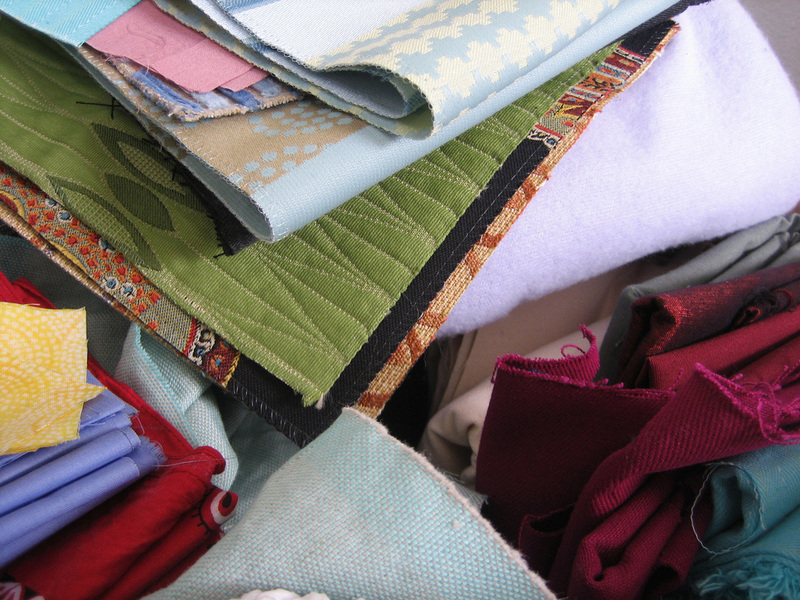 I have all this fabric and every time I go to make something I think to myself that what I have simply will not do. Once upon a time it was organized, with everything neatly folded and arranged by color, but then life happened, and now it’s more of stuffing and stacking things so they stay within the general confines of the box. 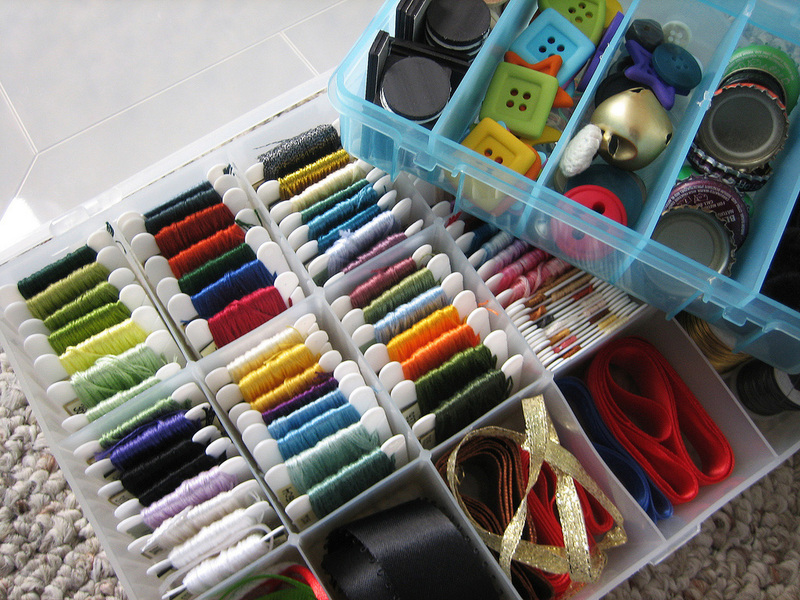 When I’m having a bad day, I’ll just pull out one of the boxes (embroidery floss box, craft things box, or fabric box) and rifle through ’em. Because even though I’m generally not big on colors (a fair percentage of my wardrobe is black), I do like colors in most things. So that’s my kind of pick me up. Oh, and this is linked over to kootoyoo’s blog where there’s a whole list of people’s creative spaces. So much fun to browse. I ADORE holidays, even the random ones. A lot of blogs out there are talking about Halloween, but over here, I’m getting ready for the Mid-Autumn Festival aka Moon Festival tomorrow, Saturday, October 3rd. Its date changes every year because it’s calculated on the lunar calendar, but it’s a great cultural holiday that involves the eating of moon cakes, which are delicious. Currently my moon cakes are hanging out in my fridge, just begging to be consumed, but I will resist until Saturday! The main reason I love holidays is gifting. I love giving gifts, and I love receiving gifts. Just the small things make me happy. This post is about gifts I’ve received recently, from people around the blog world. 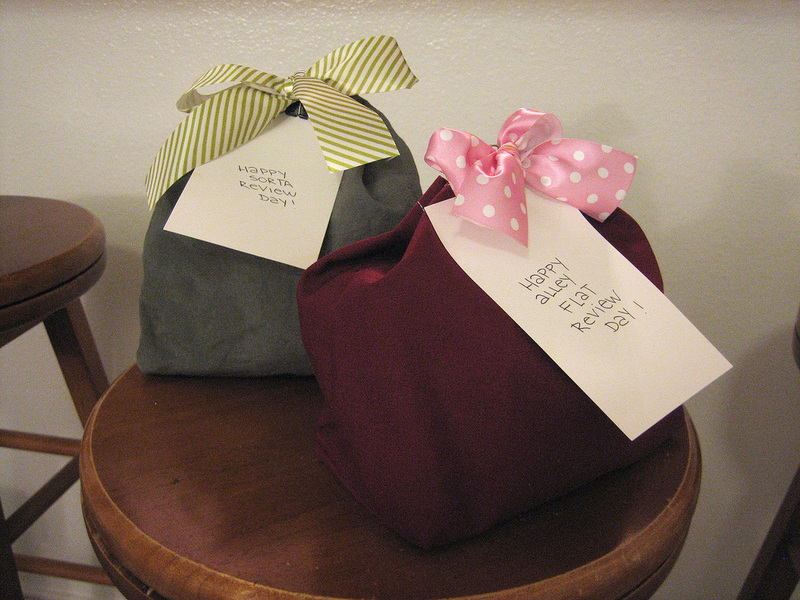 Giveaways just make everything warm and fuzzy, don’t you agree? Now I just need to make something worthy of being given away to keep the happiness flowing. This beautiful pair of earrings (called “Pure Kindness”) from Jane at She Greets the Day arrived in the mail, really nicely packaged. 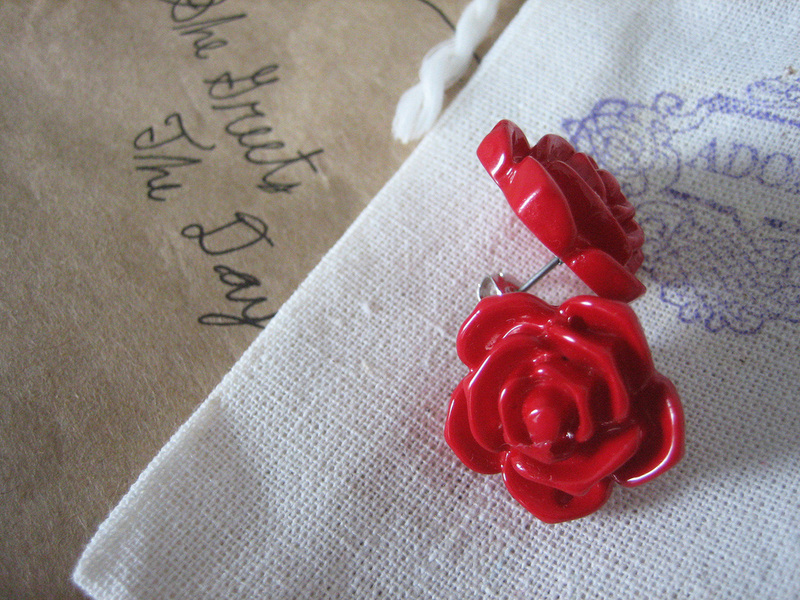 Jane has a lovely little etsy shop with cute pieces of jewelry that you should check out. It’s always nice to find someone in blogger land who isn’t a mother. No offense to all of you out there, but sometimes I feel weird reading all these posts about children and families. 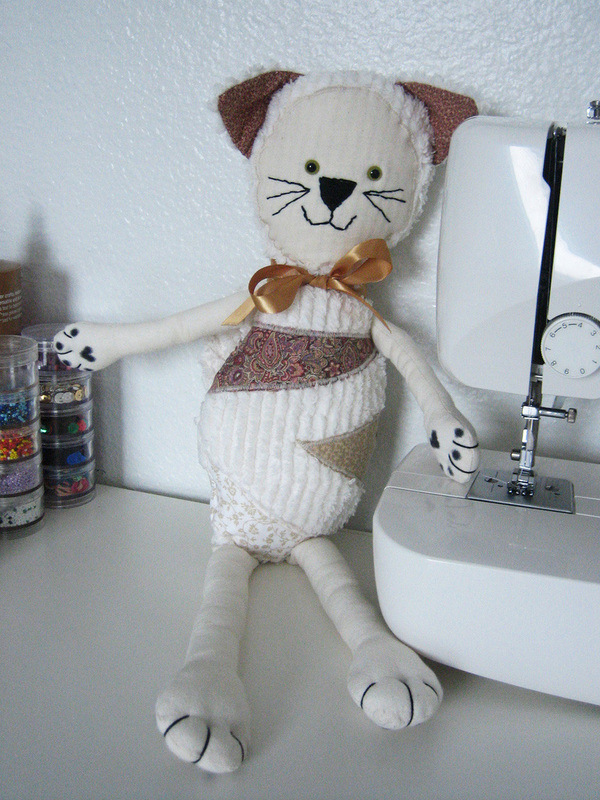 Then there was this Callie Cat from Debra at Creative Ramblings. Precious! Currently I have her chilling out on my crafting table, sitting next to my sewing machine, chiding me for not being more productive. I feel bad because Debra spent a fair amount just on the shipping, but I do love the fact that my room now feels more homey because of its new addition. 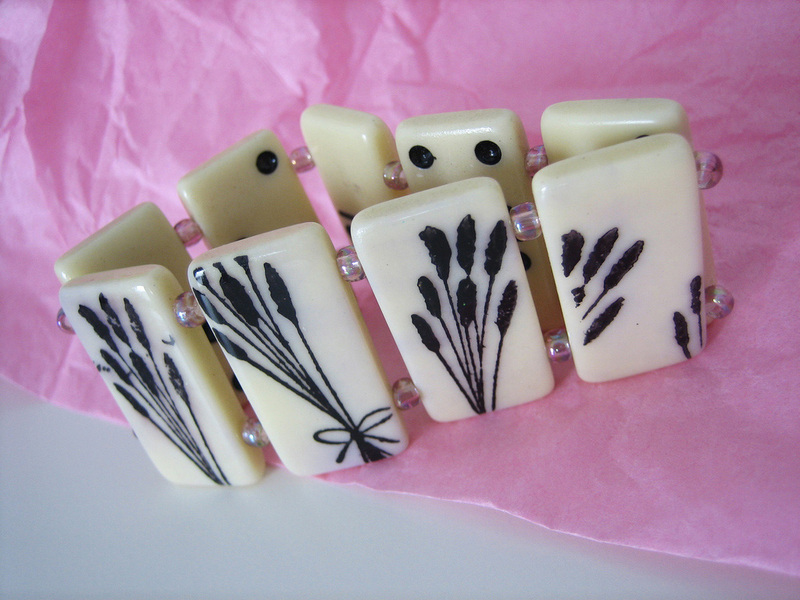 Last, but not least, Lisa from The Davis Dialogues sent me this bracelet with panels of lavender … on dominoes! Nifty, eh? It’s a nice, chunky bracelet. I’ll probably wear it when I go out tonight. Oh, and I stopped by Michael’s the other day and bought some snaps, so there starts my October total. First thing on this weekend’s list is grocery shopping, because I am out of food. Seriously out of food, as in I was starving and ended up driving to McDonald’s (the closest food source) to buy dinner. I feel pretty disgusted with myself. But I have moon cakes to look forward to and happy thoughts. Yeah, let’s not think about that essay … or that test … or the real world. But thanks to all of you! Yay Jane, Debra, and Lisa!